Imagine No Malaria will get a million-dollar-plus boost, thanks to a generous gift from a lifelong United Methodist who just wants to give back – the largest gift to date from an individual donor. The California-Nevada Conference of The United Methodist Church hopes to raise $2 million in order to save 200,000 lives through Imagine No Malaria, an initiative of The United Methodist Church to end preventable deaths from malaria in Africa by 2015. A generous gift from one church member this week put them well over halfway to that goal. Ferguson decided to make the gift after hearing a presentation by Bishop Warner H. Brown, Jr. of the San Francisco Episcopal Area, upon his return from a trip to Angola. Ferguson is a member of Los Altos United Methodist Church since 1985 and one of the leaders for the church’s Stephen Ministry who has worked as a volunteer in the finance office for 17 years. 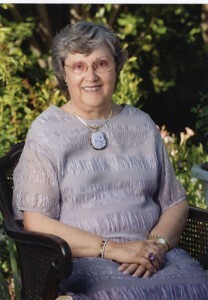 Her late husband, Earl Ferguson, had a successful career in the computer science industry and helped to develop two companies that were awarded four patents. Eventually, one of the companies, Foundry Networks, went public. Following Earl’s unexpected death in 2003, Ferguson and her family have continued to resource efforts to make the world a better place. Just a few short years ago, statistics showed a child died every 30 seconds of malaria. Today, malaria’s impact has been cut in half. According to the World Health Organization (World Malaria Report 2011), the disease now claims a life every 60 seconds.